The main parts of the vanity itself are two IKEA ALEX Drawer Units and the IKEA LINNMON table top which costs just $173. A friend gifted me the Vanity Girl Starlet Lighted Mirror in White (also check out the Vanity Girl Starlet Lighted Vanity Mirror in black). The vanity mirror is the most expensive part of this whole set up at $299 + $29 shipping. It’s an investment, but it adds such a girly and glamorous touch to the set up. It also has a lifetime guarantee which is awesome. If you are a beauty junkie like myself you will love this mirror. It is huge at 25″x18″. It comes with salon-grade dimmable soft, clean white lights that also make for excellent selfie lighting. Four years later and I still haven’t had to replace a light bulb even though I use this mirror daily! The Vanity Girl Hollywood mirror also comes in black or in a tall /vertical version (that’s 8″ x 25″ mirror- so same size just turned the other way and more lights ($399). that can be mounted in the wall as well. The vertical version of the mirror has even more lights and also has 2 outlets in it which makes it perfect for connecting a blow dryer or curling iron. Vanity Girl Hollywood Lighted Mirror – Vertical with additional lighting. This version can be tabletop or wall mounted. The owner of Vanity Girl Hollywood saw this blog post and did a super sweet write-up about it on her blog! If the Vanity Girl Hollywood Lighted Mirror is outside of your current budget, remember that you can use any old mirror mounted on the wall behind your vanity and you can get LED light strips to put on each side to fake it until you make it! There’s also tons of YouTube tutorials on how to make your own lighted vanity if you’re feeling crafty. The Ikea ALEX 5 drawer unit has become a staple for beauty enthusiasts. These drawers are affordable ($79) and they are the perfect size and shape for makeup storage. My Ikea Alex eyeshadow drawer- I used ice cube trays from the Dollar Store to store all of my single eyeshadows. The drawers are the perfect depth for makeup and hair products. When you open them you can have a nice, clear view of everything. They can store a LOT of makeup. More than you would think upon first glance. IKEA Alex drawer with makeup organization – my lips & lashes drawer. If you want your drawers to last a long time be sure to divide divide your makeup up amongst each drawer. If a drawer is too heavy they will not slide properly and can break. For my vanity I bought 2 Ikea ALEX 5 Drawers in white. I’m not a very strong girl so I was worried about going to the Ikea store by myself to get them, but I managed alright. I did need another person and a shopping cart to get them upstairs and into my apartment. The package each 5 drawer set comes in weighs 60lbs. I actually loved the quality of these drawers so much that I bought a third set to use as part of my computer desk. I bought the third set used on Craigslist so it was half the price and already assembled! I have also since bought a large IKEA dresser and an IKEA bed because I love the quality of their storage so much! MadeULook ‘s Youtube tutorial on how to assemble IKEA ALEX drawers was super helpful! You might have seen on Pinterest that there is a dupe for the Ikea Alex 5 Drawers at Michaels- the Recollections 5 Drawer Cube. The cheaper price tag may have tempted you, but I did a lot of research, watched tons of videos, and read many reviews before making my decision. Recollections 5 Drawer Cube. This photo is from My Newest Addiction. I came to the conclusion that the quality of the Recollections 5 Drawer Cube is just not there. You may think that IKEA doesn’t have the most high quality products, but these IKEA Alex drawers are very durable and really great quality. The Recollections 5 Drawers are nowhere near it. I personally think it’s worth the investment in the IKEA Alex 5 drawer set. Another important thing to note is that the dimensions of these drawers are not the same as the IKEA ALEX drawers. This means the IKEA Alex drawers are more rectangular at 14×22 vs. the Winsome drawers which are more square at 19×16. I did a lot of research and measuring in my room to decide what size table top to get for my vanity. The table top is held up by the two IKEA Alex 5 drawers to create the vanity. I do not have anything in between the drawers and the table top to secure it. The weight of the vanity mirror keeps it in place. I went with the IKEA Linnmon table top in white the 47 1/4x 23 5/8″ size ($14.99). I needed a size that would be big enough for my huge Vanity Girl Hollywood Lighted vanity mirror. This size is great there’s plenty of room for everything including my legs to go underneath! When I first put together my vanity my friends made fun of me because I kept the plastic wrap on the Linnmon table top. I was terrified of spilling makeup on the pristine white surface and staining it forever! Clear acrylic sheet to protect the top of my vanity. I finally forced myself to go to Lowe’s to get an acrylic sheet to protect the table top. I bought the OPTIX 0.08-in x 24-in x 48-in Clear Acrylic Sheet ($30). This is the correct size for the IKEA Linnmon 47 1/4 x 23 5/8″. This acrylic sheet is 10x stronger than glass and has a 10 year non-yellowing warranty. This makes the vanity so easy to clean I just wipe it off with a paper towel and an all purpose cleaner. Warning: I have had to replace this once and my second acrylic sheet is warped again from my curling iron/flat iron. It’s not super noticeable to anyone but me, but just be careful that heat can warp it! I had considered getting one of those beautiful (and super pricey) mirrored vanities they have at Z-Gallerie and Pier One, but the thought of dropping a curling iron and chipping the glass freaked me out too much! This is one part of my set-up that is a work in progress. I already owned this Target Room Essentials Cube Storage Ottoman (similar) so that’s what I’ve been using. It’s square and about 15.5″ across the top of the seat. This ottoman is not the nicest quality, but it’s comfortable enough and it doesn’t take up much space. This ottoman can fit underneath the vanity when I’m not using it so it keeps the path clear. I’d like to get a nice comfy seat with a back in the future, but this is what I’m working with at the moment. I love this blush pink velvet ottoman from Amazon. It’s 15″W x 15″D x 18.1″H and about $66. I now have this faux sheepskin rug that I found on Amazon for under $20 laying across my vanity’s seat. It’s a great accessory and makes the vanity more cozy and chic. Faux sheepskin rug- I use this over my vanity seat to make it cuter. My IKEA ALEX vanity with the drawers open. You can see the faux sheepskin on the ottoman. (Left) My makeup brushes are actually in a candle holder from Target. This is the Antique Mercury Glass Candle Holder- (edit: this is no longer available here’s a similar one from Amazon ). Other things you can use for makeup brush holders- pretty cups/mugs, flower pots, re-purposed candles, vases, etc. (Center) At $3.99 this Skurar off-white plant pot from Ikea is another beauty guru DIY makeup brush holder fave. 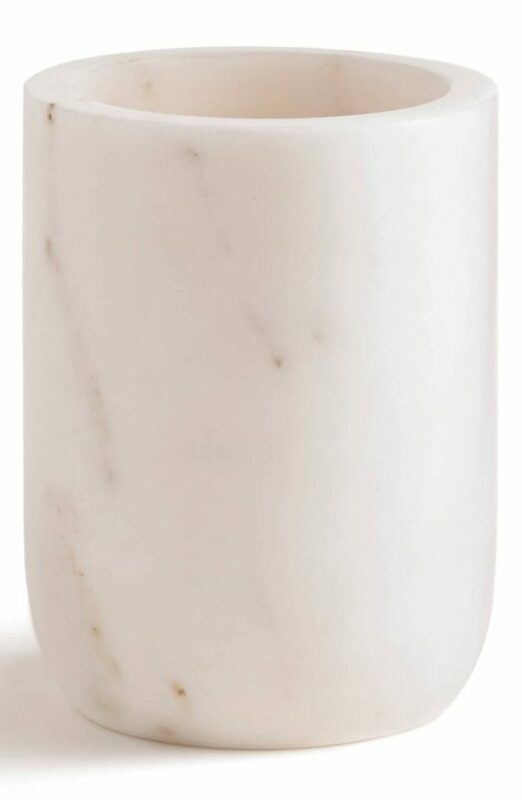 (Right) This Kassatex Pietra Tumbler ($35) in white marble would also make a great brush holder. This clear acrylic envelope organizer can be used to hold makeup palettes. When I saw these Ikea Liksidig napkin holders ($3.99) I thought they might make cute makeup palette holders/displays on top of the vanity, and they work! They only fit about 2 palettes each so keep that in mind! This Kantek Acrylic Mini Sorter ($11) would also work nicely as a palette organizer and would probably fit a few more than my napkin holders. I love this mirrored vanity tray/mirrored perfume tray from Amazon and it’s under $20! 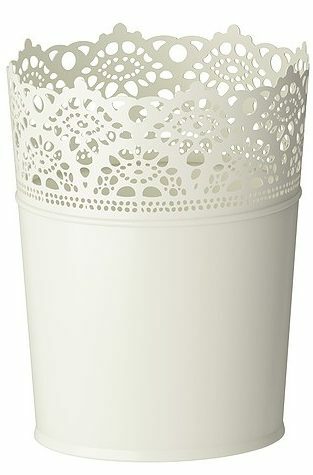 The IKEA Droppar Glass canister can store cotton balls, cotton pads, or q-tips. This Kassatex Pietra Cotton Ball Jar looks super chic with it’s rose gold top. This is another item that I saw in store and thought “ooh that would work great!” This is the Ikea DROPPAR frosted jar with lid ($2.99). I store cotton rounds and q-tips in it. If you’re more into a white marble vibe this Kassatex Pietra Cotton Ball Jar Jar ($48) would be a beautiful addition to a vanity. I already had this Conair Reflections LED Lighted Collection Mirror ($28) and use it daily for my brows. It’s great for seeing up close. When I put fake lashes on I like to look down into a mirror to help me place them and this is what I use. I reviewed the much more expensive ($200) 8″ SimpleHuman 5x sensored vanity magnified mirror here. It’s a great option if your eyesight isn’t great and you need a really amazing magnifying mirror to apply makeup. I’m not gonna lie, the pink version is pretty darn cute. What vanity is complete without flowers and candles!? The fake peonies on my vanity are both from TJ Maxx. HomeGoods is another excellent place to find gorgeous fake flowers. The candle is a Voluspa 2-wick candle in Laguna ($16) given to me by my friend Rachel. 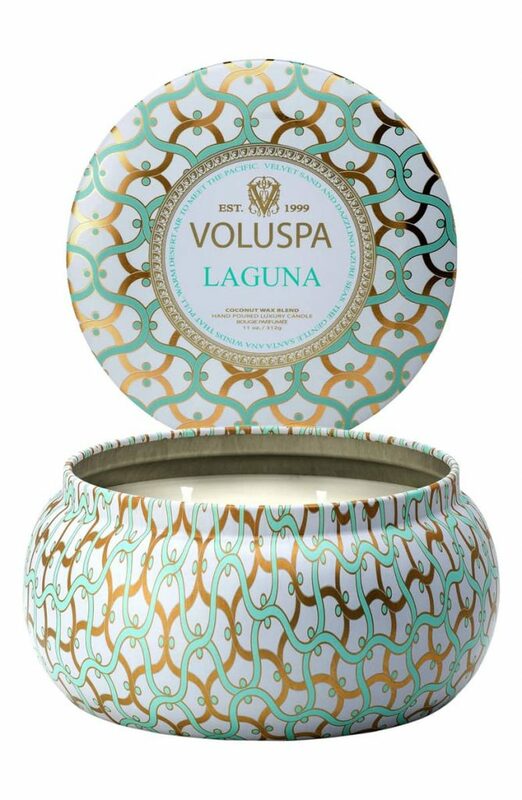 The candle on my vanity is a Voluspa 2-wick candle in Laguna ($18) given to me by my friend Rachel. 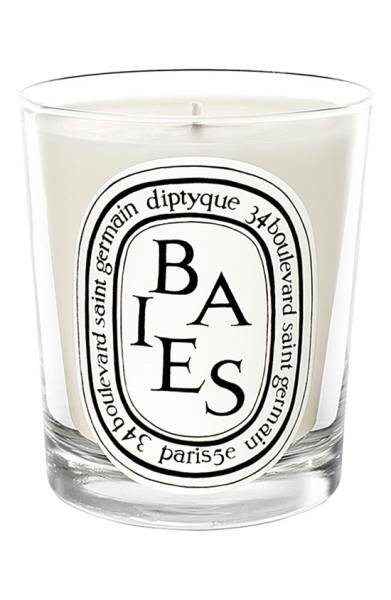 If you want to upgrade to a super fancy beauty blogger candle, the Diptyque Baies Scented Candle ($65) is a classic. Once the candle is done burning you can clean out the wax and it would make a beautiful brush holder! 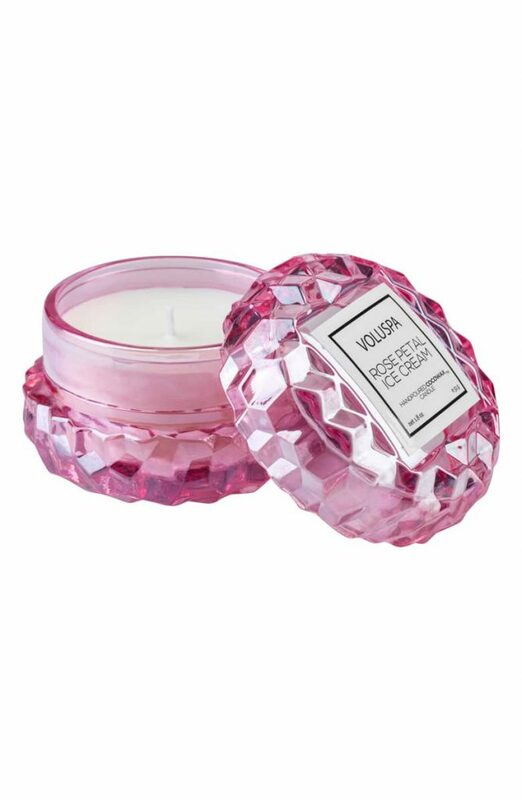 A few months ago I added the Voluspa Roses Macaron Candle ($13) which is the perfect little girly touch of pink to my vanity. It also smells amazing. I put the white/clear Voluspa Milk Rose Macaron Candle on my DIY IKEA RAST Nightstand by my bed. I now have an essential oil diffuser like this one by Serene House ($40). I love to put in a citrus blend in the morning and a lavender in the evening to set the mood. If you like to keep tissues handy why not do it with this super chic Waterworks Studio ‘Luna’ White Marble Tissue Cover ($75)? Side view of my vanity where you can see my Vanity Girl Hollywood Lighted Mirror, a rose gold perfume tray, my mercury glass candle holder that I put makeup brushes in, faux peonies, and my Conair magnifying mirror. I have also added one of my most important accessories to my vanity- a CLOCK!! Because time seems to drift away as I’m beating my face at my vanity. My clock was from Target and it’s no longer available online, but this marble digital desk clock from Amazon is super cute and only $17. The Amazon Echo ($85) would be a great addition to the vanity so you can listen to some music while you get ready. You can also ask her what the weather is before you do your hair! I mostly keep my Amazon Echo in the kitchen so I can ask her to set timers for me while I’m baking. I connect her to my phone when I’m washing dishes to make YouTube videos or podcasts louder as well. The IKEA Malm Dressing table ($169) is nice because it’s all in one and already has the glass top to protect it from spills. The Malm didn’t have enough storage for my sizable makeup collection. If you own a normal amount of makeup this is a great more affordable option. The other reason I didn’t get the Malm table is the length of the table is the same as my Ikea ALEX vanity, but the width is 16 1/8″ compared to my 23 5/8″. I didn’t think this would leave me any room on top once my Vanity Girl Hollywood mirror was in place. A mirror that mounts to the wall would work great with the Malm. The Ikea Hemnes Dressing Table ($249) has one large drawer like the Malm dressing table and a nice mirror, but again this wasn’t enough storage. Plus I already had my big mirror first so I knew this one wasn’t for me. If white vanities are not your thing, I love this glam gold champagne and glass Enid Contemporary Vanity Set with Mirror by Everly Quinn modern vanity. You will have to keep everything in the drawer super organized since you can see right through it! This vanity includes the mirror and seat. If you’re not into the DIY thing but would like some storage/organization for your makeup vanity the Kirkwood Bedroom Makeup Vanity Set includes the storage, mirror, and vanity seat. This Lyra 2-Piece Mirrored Vanity & Stool Set by Willa Arlo Interiors had a beautiful mirrored finish and also includes the mirror and the matching vanity stool. This one reminds me of Lisa Vanderpump’s Vanity. The Z Gallerie Studio Mirrored Desk ($499) is super chic and fancy looking. I didn’t choose this one because it doesn’t have enough storage for my collection. I was also worried I’d chip the glass by accident! The Z Gallerie Studio Mirrored Desk can be made into a vanity. The Z Gallerie Jett Desk ($599) was too big for my space and looked like it would give me bruises all over my shins. The Pier1 Hayworth Vanity in Silver ( $399.95) is another popular one, but again not enough storage for me and I was afraid I’d break it. Check out my DIY IKEA RAST Nightstand post too! My DIY IKEA RAST pink nightstand! Want More Beauty Room Inspo? Disclosure: This post contains affiliate links. Read more about what that means and how it works on my Disclosure page. Thank you for your support!